Italy is frequently cited as the most beautiful country in the world, due to its stunning landscapes, rich history and fascinating cities. The south stands out from the crowd for several reasons and while it lacks the order and discipline of the north, it scores high marks aesthetically. Amalfi prints brilliantly capture the charm of the province of Salerno and the western coast, with ChefDecor.com posters doing justice to these mesmerizing places. Conveniently located near Naples, the coastal town changed very little over the course of time and the most beautiful features were well preserved. 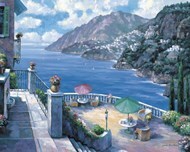 The Amalfi posters at ChefDecor.com will invite you to take a virtual voyage to one of the most beautiful areas in Italy, while turning any interior into a classy room. Those who have a keen eye for beauty will prefer the Amalfi paintings created by gifted artists, as they have the uncanny ability of making any room look like a museum. There are some great aerial photos of the area to enjoy and if you prefer to see all the details, the high resolution Amalfi photos should adorn your wall. 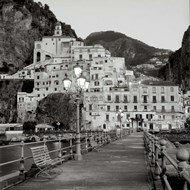 Most of the Amalfi prints depict generic places while others focus on the coast and the popular tourist landmarks. Regardless of how familiar your guests might be with this area, or how little they know about rural Italy, the posters will fascinate them. They are a great addition to personal collections, but look great even as standalone posters on an office wall.